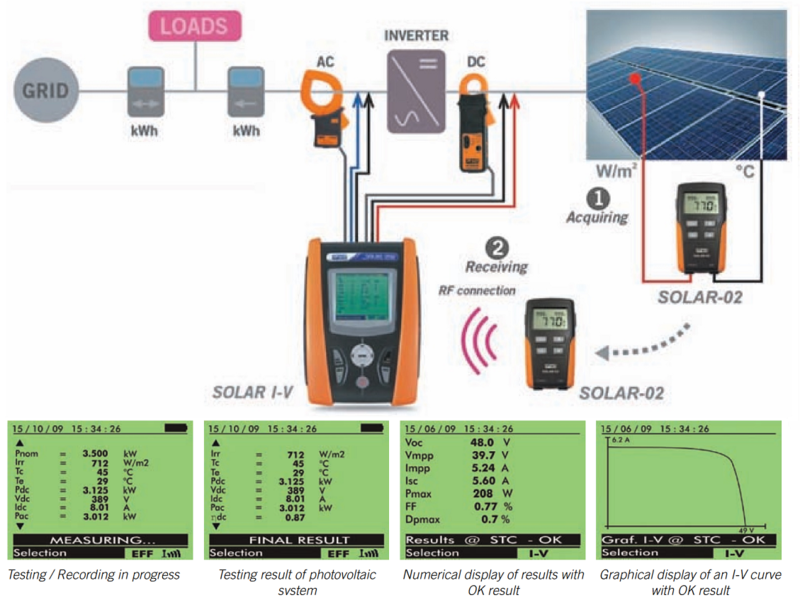 SOLAR I-V has been designed to meet any requirement of photovoltaic installation testers. Further to providing the possibility of testing and measuring the efficiency of single-phase photovoltaic systems and also measures the I-V characteristic both of a single module and of module strings. Thanks to SOLAR I-V, the operator can test the photovoltaic system and, should it give a negative result, immediately identify the problems of the system in order to promptly solve them. SOLAR I-V is provided with the remote unit SOLAR-02 for measuring irradiation and temperature. The synchronization between main unit and remote unit, by radio-frequency (RF) wireless connection, guarantees the necessary simultaneity of measurements. SOLAR I-V also manages a database of photovoltaic modules, which can be updated at anytime.